The art of ensemble is one of the most fascinating aspects of improvised music to me and any ensemble that includes piano seems almost doubly so. Why? The range of the piano is so large, both in pitch and timbre, and typically requires both hands, which the pianist can utilize in whatever way they choose. Will they use both hands in conjunction with each other? Will the hands each take on a mind of their own? Will the player start with the hands in conjunction and then separate or vice versa? Or neither? Listening to Matthew Shipp is a journey, and I always assume that I have an idea of where he’s going to go as soon as he touches the keys because of my familiarity with his work. And yet, every time I assume anything, he proves me wrong. He is one of my favorite pianists to see and hear live, particularly in intimate, small ensemble situations because to me, his playing is balanced, sensitive, and finessed while still being powerful and distinctive. Cactus, in duo with Bobby Kapp, is no exception. 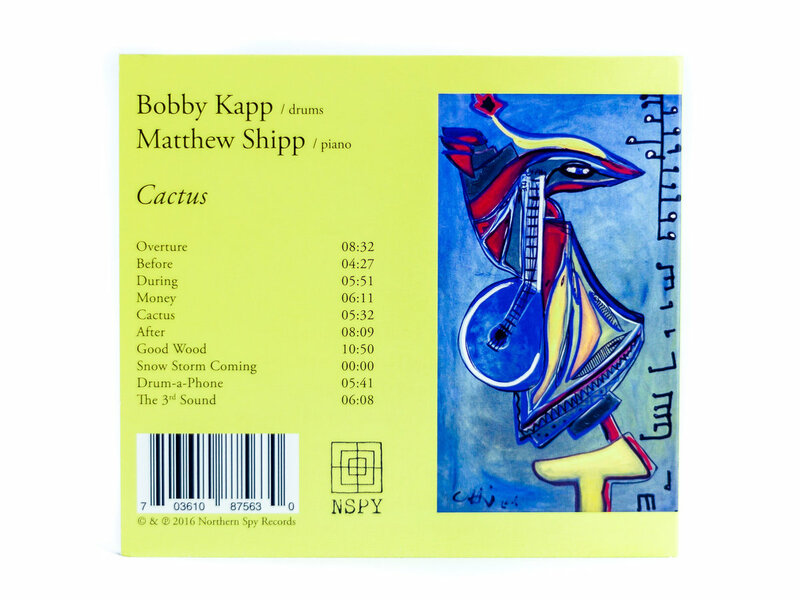 I hadn’t known much about Bobby Kapp prior to this album, but I hope that his performance on this album affords him more notoriety as I found his playing to be lyrical and exquisite. Throughout the album, I noticed two distinct personalities that maintained independence without waiting for the other to answer, two distinct lines intertwining as well as taking their moments to shine alone. And yet, in spite of this independence, the lines were always completely complementary and definitely did not sound like the two players were on two different planets, a criticism I sometimes have of freely improvised music. The lines were structured in a way that was intuitive and seemingly thought-out, yet spontaneous, and I credit both improvisers in their ability to stay present in what the other is doing while still creating something beautiful themselves. I was enthralled by the contrast of textures throughout the album: looming, threatening, tumultuous patterns in the bass end of the piano relieved by gleaming, almost strident forays into the upper register. Chaotic yet lyrical passages soaring throughout the range were brought abruptly to an end by punctuated ensemble between the two players. The plucking of strings sounded much like the album’s namesake’s needles, gently enveloped by the reverberation of gently stroked, shaking cymbals. Sparsity, a soundscape of a desert complete with tumbleweeds and not much else, gave way to lush moments of nearly impressionistic or neoclassical grandeur, not dissimilar to the sounds one would expect from Debussy or Stravinsky. This was particularly prominent on the album’s second track, “Before”, which I would label haphazardly as “Matthew Shipp’s Homage To Great Pianists and Composers of the 20th Century” as it’s array of elements lent me a strong Monk and Basie vibe as well. I found the track particularly entertaining and actually giggled at a few points during my first listen because his quoting of many well-known pianists’ styles was so far from what I had initially expected when I first put the disc in the stereo. Backtracking a bit, I made a reference to the piano having the ability to, for lack of a better term, play duet with itself. I would be remiss in my duty if I failed to mention that I hear this quality in Kapp’s playing of drums, cymbals, and auxiliary percussion as well. I can hear melodies buried gently beneath the overlapping rhythms of each distinct percussive voice, both when the drums are solo and when they’re playing alongside Shipp. Each of Kapp’s melodies, when isolated, stand alone beautifully, but are also unobtrusive enough to mingle among even the gentlest melodies of the piano without dominating the entire soundscape. Cactus is an enjoyable journey, rich with both expectations and surprises. I look forward to hearing Kapp and Shipp together in the future and hope to discover more recorded evidence of their wonderful chemistry together.